What’s the real cause of Type-2 Diabetes? A woman contacted me after reading an earlier blog I wrote on diabetes. She is 53 years old and was diagnosed with type-2 diabetes about 18 months ago. She found the information I discussed was different from that of the diabetes clinic and her doctor. This woman’s story was typical of the people I work with. She first went to her GP when she wasn’t able to lose weight about 18 years ago. Her weight had increased from 65-85 kg through her four pregnancies. Following a series of blood tests, she was told everything was normal and she should try to eat less and exercise more. Not the easiest thing to do when you have four children and a full-time job! Fast-forward 16 years and numerous doctors’ visits about her weight, fatigue and other issues. She was prescribed a statin for high cholesterol while her weight continued to increase and further health problems developed. She was diagnosed as a type-2 diabetic and began taking insulin. At our first consultation, she had a lot of questions about cholesterol and diabetes that she felt hadn’t been answered. She was very upset that no one in 18 years had told her she was pre-diabetic or that taking a statin increases the risk of type-2 diabetes in women by about 32%. In the case of type-2 diabetes, part of the problem lies in the understanding of what this really is. What is not well understood is that elevated blood sugars are not the cause of diabetes; they are the symptom. Our blood sugar is under very tight regulation. To maintain control there are a lot of mechanisms in place. One of the most important is the hormone insulin. Insulin plays many important roles in the body and is necessary for good health. One of these roles is in helping transport blood sugar into cells. Unfortunately, too much insulin damages the cells. When this happens consistently the cells develop resistance to insulin. For obvious reasons, this is called insulin resistance syndrome. 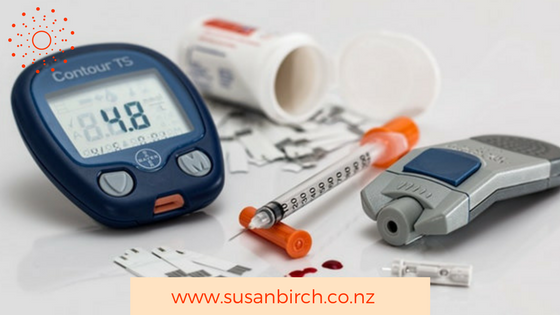 Hundreds of thousands of New Zealanders are not aware they have insulin resistance syndrome. Over time, as this resistance increases, high levels of sugar and insulin circulate in the blood and this is when diabetes develops. Many people eventually reduce the amount of insulin their pancreas can make and like my client, have to have insulin injections. The test that is considered “gold” standard (dictated by the Ministry of Health for doctors to use), for measuring blood sugar is called HbA1c. This test provides an average of our blood sugar levels over 3-months. The problem is that it doesn’t tell us about our insulin resistance until it is too late. Many people have great HbA1c levels for years until suddenly they don’t. Remember, insulin is the hormone that helps control our blood sugar. So, even as we develop resistance to insulin, and these levels increase, HbA1c is maintained. Because diabetes is misunderstood as a problem with blood sugar levels, insulin is never considered in this equation. Anyone who has increasing weight, chronic fatigue, and carbohydrate cravings should make sure their insulin levels are also tested. The answer is obvious; carbohydrate consumption has the most effect followed by protein. If you eat carbs you increase blood glucose, when you increase blood glucose you increase insulin. If your insulin remains high for long periods after eating, you have insulin resistance syndrome. Unfortunately, the advice given by nutritionists, dieticians, diabetes doctors and GP’s is usually to stop eating fat (saturated fat in particular) and increase your intake of healthy grains and cereals with plenty of fruit and vegetables (I agree with the vegetables). However, eating this way increases blood sugar levels and the cycle continues. Firstly, test HbA1c, blood sugar and insulin levels to get a real picture of what is going on. This is useful when someone is experiencing weight gain, fatigue, brain fog, aches and pains as these are all symptoms of elevated insulin. Five different stages of this condition have been identified. Secondly, decrease your carbohydrate consumption. After working with my client for 3 months she is no longer taking insulin and has lost 9 kg. Her cholesterol levels have also improved with a big decrease in triglycerides and an increase in HDL-C our “good” cholesterol (but that is another story). If this sounds familiar to you or you know of someone struggling with diabetes or cholesterol I would love to hear about it. Contact me here to schedule a time for an initial chat and start restoring your health today.